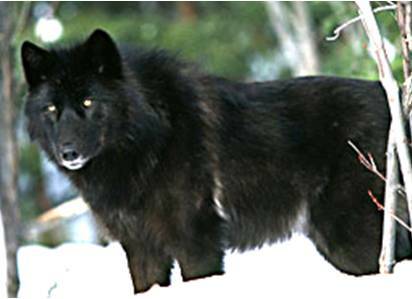 The Dire Wolf is an extinct member of the Canis Family genus. In fact, it may have been the largest member of that family to have ever lived. It was similar to modern Timber Wolves, but larger and more robust. Typical length being 5ft. and weighing 110-175lbs. 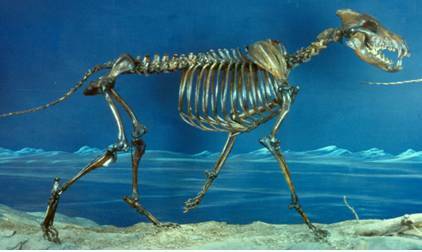 Canis dirus ranged from the west coast of North America, to the east coast, and to Florida. It also migrated to parts of South America. Hunting Peccaries, Deer, Llamas, Horses and young animals like baby Mastodons & Mammoths. These Prehistoric Wolves hunted in Wolf packs of 3 to as many as 20 individuals, and were both hunters and scavengers. The legs of this "Big bad" wolf were significantly shorter than a Gray Wolf, but the head and teeth were more massive. 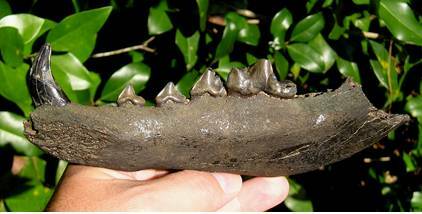 This stocky predator's teeth may have been used to crush bones. 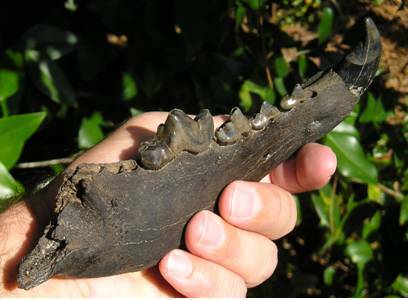 Canis dirus is well represented in Florida’s Fossil Record and is considered a major part of the Pleistocene Megafauna.